It was a cold, damp and rainy day here today. I was in the mood for comfort food when I got home this evening. Last night, both of my boys came for dinner and I made my Sweet & Spicy Peanut Dusted Chicken. I love, love, LOVE this chicken. 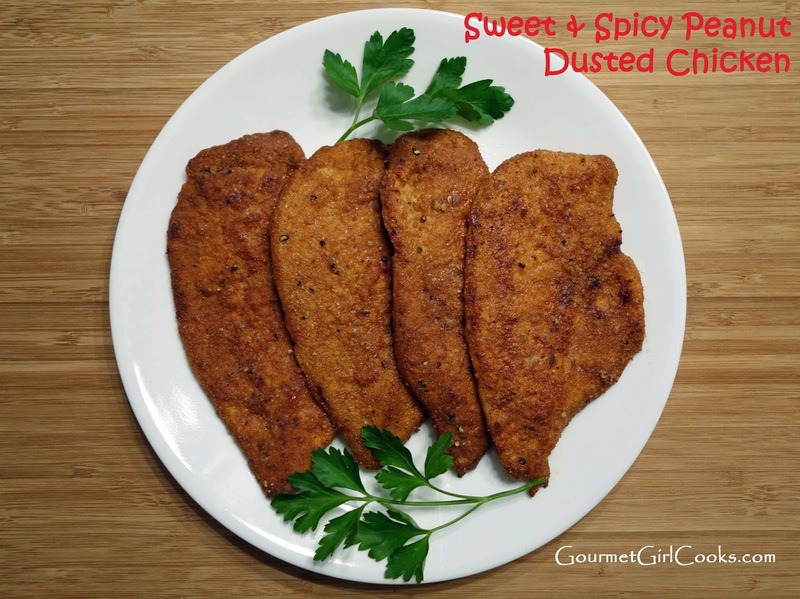 I simply dust chicken cutlets with super finely powdered peanut flour (made by Protein Plus) after dipping them in egg wash. I season the peanut flour with cayenne, salt and sweetener (I use Swerve). The combination of toasty peanut flavor mixed with the spicy sweet undertone is a delicious combination. 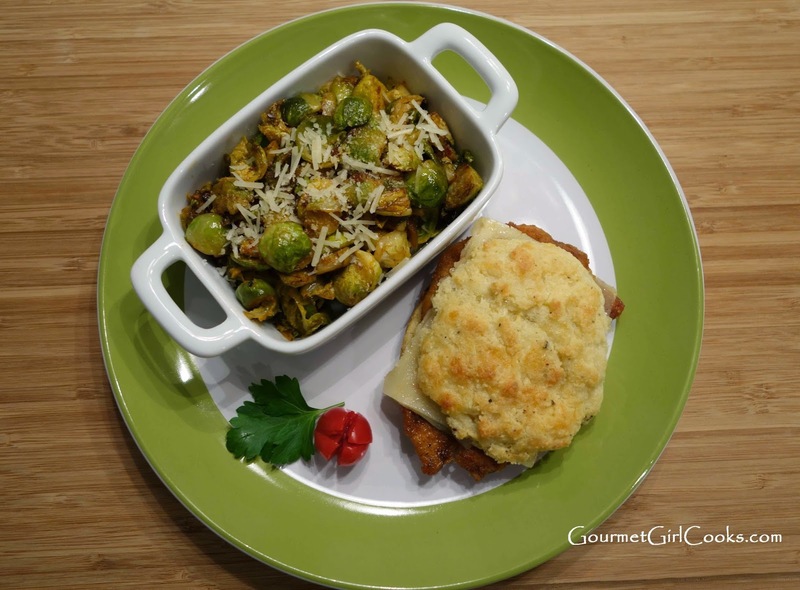 I like to eat these cutlets as is...but I absolutely love them topped with melted cheese and sandwiched inside one of my Cheddar Black Pepper Biscuits -- it puts me in chicken & biscuit heaven! When I got home, I made a batch of my Cheddar Black Pepper Biscuits and used extra sharp white cheddar cheese in them (instead of regular yellow sharp cheddar). They turned out super delicious. I had 2 leftover cutlets from last night's dinner. I reheated them and topped them with white cheddar jalapeno cheese and used tonight's "white cheddar black pepper" biscuits to make sandwiches with them. For my side dish, I used the leftover lightly steamed sliced brussels sprouts in the fridge to make something totally different with them. I sauteed and caramelized some sliced onions in a skillet with a bit of butter. I added the leftover sprouts and cooked them along with the sauteed onions until they were lightly browned. I added a couple teaspoons of sun-dried tomato pesto to the sprouts along with a splash of olive oil and cooked them a bit more. 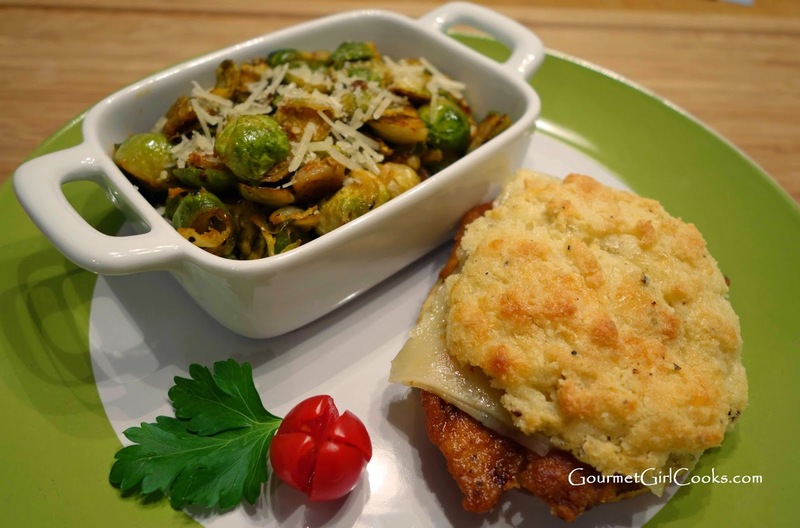 When they were cooked to my liking, I stirred in a few tablespoons of finely grated Parmesan cheese and placed them in a little casserole dish and then sprinkled with a bit of shredded Parmigiano Reggiano...and "Voila" I was enjoying Parmesan Pesto Sprouts...just another way to enjoy my beloved brussels sprouts. 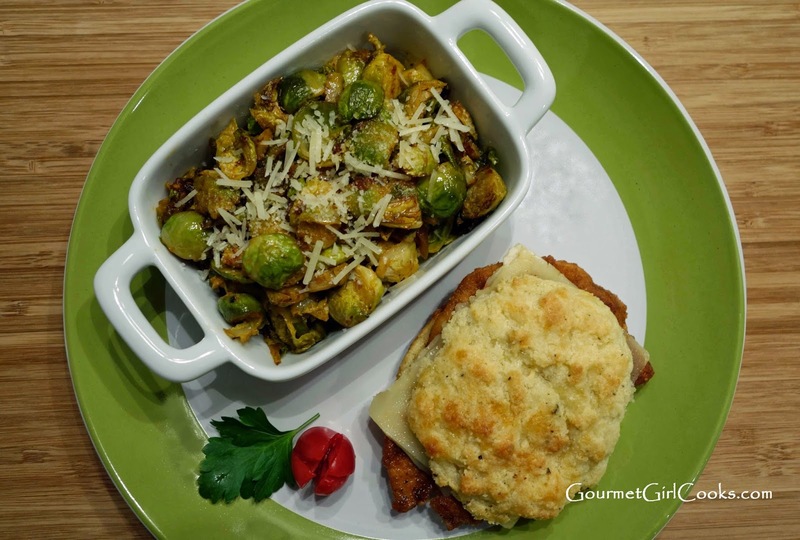 By adding just a little bit of sun-dried tomato pesto, sweet caramelized onions and Parmesan cheese...it added such a delicious and unique flavor to the sprouts. I will definitely prepare them this way again. I snapped a few photos below and included my recipe for the Sweet & Spicy Peanut Dusted Chicken, too. Enjoy! Last night's chicken cutlets became tonight's "chicken-biscuit sandwiches"
In a small bowl, combine egg, cream, salt, pepper and cayenne; beat until combined. In a shallow bowl, combine peanut flour, salt, pepper, cayenne and sweetener. Dip cutlets into egg wash and then into flour mixture; shaking off any excess. Place in a large skillet coated with oil over medium-high heat; cook until golden brown on both sides, about 2 to 3 minutes per side. Transfer cooked cutlets to a plate lined with paper towels. 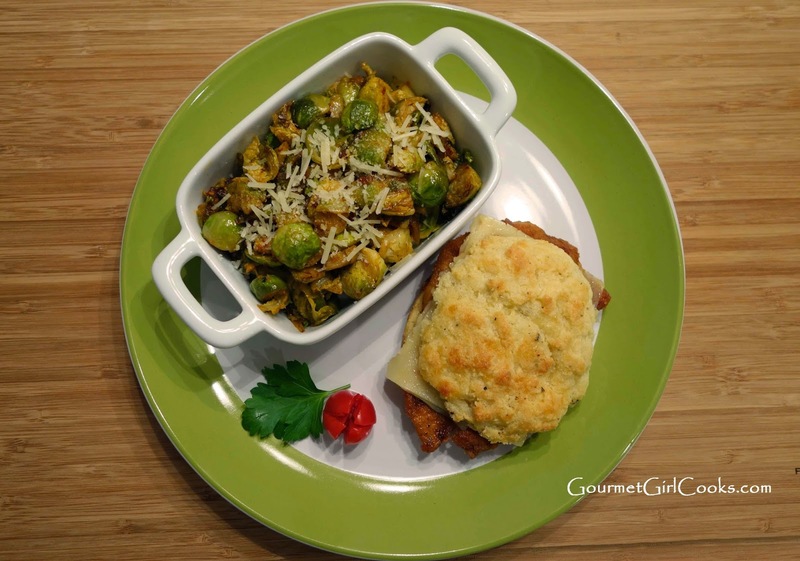 Serve as is or sandwiched between halved biscuits and topped with cheese. 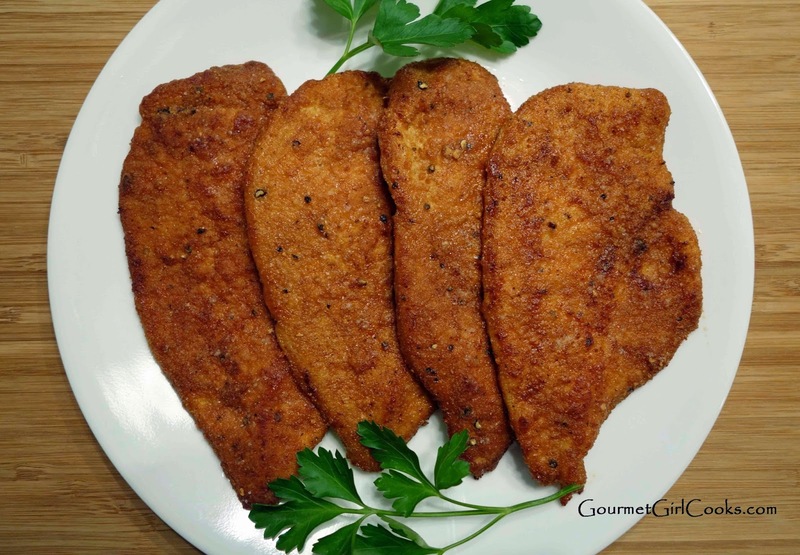 Your chicken cutlets look amazing! How do you get them so uniform, do you pound them?